BBC America: Doctor Who Season Seven Premiere Date Announced, EXCLUSIVE Trailer Released! Tons of Info on New Season! Read the press release below, folks, there’s episode synopses and cast and production staff interviews in there, as well. The only thing that strikes us as rather confusing is that in all previous announcements from BBC America, they have indicated that the season would consist of 14 episodes (as per the usual), not five, as noted in the press release below. Heck, even in BBC America’s video description on YouTube they mention the 14-episode season. What it looks like to us is that the first five episodes of the seventh season are going to be standalone adventures that center around the Ponds and their ultimate departure in episode five. The rest of the season will be an arc that picks up from that point. We’ll look into this and provide more details as they become available. BBC AMERICA’s Doctor Who returns after a record-breaking season with five blockbuster episodes on September 1 as part of Supernatural Saturday. Join the Doctor, his companions Amy and Rory (aka the Ponds) and numerous friends on their latest escapades through space and time where they puzzle an unexpected invasion of Earth, save a spaceship full of dinosaurs, don Stetsons in a Wild Wild West adventure and are even kidnapped by the Doctor’s oldest foe. The explosive series concludes with Amy and Rory’s heart-breaking farewell – a race against time through the streets of Manhattan. Will the Doctor really lose the Ponds forever? There’s only one way to find out… Doctor Who premieres Saturday, September 1, 9:00pm ET as part of Supernatural Saturday. In the season opener, Asylum of the Daleks, the Doctor is forced on an impossible mission after being kidnapped by his oldest foe – to a place even the Daleks are too terrified to enter…. the Asylum. A planetary prison confining the most terrifying and insane of their kind, the Doctor and the Ponds must find an escape route. But with Amy and Rory’s relationship in meltdown, and an army of mad Daleks closing in, it is up to the Doctor to save their lives, as well as the Pond’s marriage. Last year, Doctor Who was the #1 top-selling series on the iTunes Store in the US. Last month, the series became the first British television series to ever grace the cover of Entertainment Weekly. Kidnapped by his oldest foe, the Doctor is forced on an impossible mission – to a place even the Daleks are too terrified to enter…. the Asylum. A planetary prison confining the most terrifying and insane of their kind, the Doctor and the Ponds must find an escape route. But with Amy and Rory’s relationship in meltdown, and an army of mad Daleks closing in, it is up to the Doctor to save their lives, as well as the Pond’s marriage.Asylum of the Daleks premieres Saturday, September 1, 9:00pm ET. An unmanned spaceship hurtles towards certain destruction – unless the Doctor can save it, and its impossible cargo…… of dinosaurs. By his side a ragtag gang of adventurers; a big game hunter, an Egyptian Queen and a surprised member of the Pond family. But little does the Doctor know there is someone else onboard who will stop at nothing to keep hold of his precious, prehistoric cargo. Dinosaurs on a Spaceshippremieres Saturday, September 8, 9:00pm ET. The Doctor gets a Stetson (and a gun), and finds himself the reluctant Sheriff of a Western town under siege by a relentless cyborg, who goes by the name of, the Gunslinger. But who is he and what does he want? The answer seems to lie with the mysterious, Kahler-Jex, an alien doctor (yes another one) whose initial appearance is hiding a dark secret.A Town Called Mercypremieres Saturday, September 15, 9:00pm ET. Details on episodes 4 & 5 will be released at a later date. Head writer and executive producer Steven Moffat gives us an insight into the monsters and adventures that we can expect from the new series. So it is back with a bang and with Daleks from every decade. Why did you decide to kick-off the new series with a Dalek filled episode? We’ve been off the air for longer than usual, so it was an easy decision to come back with Doctor Who at its most iconic and that means Daleks. Lots and lots of scary Daleks. There have been many monsters to face the Doctor over the years, but only one that can sum up the whole series just by being there. Also, it’s my first go at writing for them. I LOVE the Daleks, and I’ve held off till now. But I had what Ithought was a good idea, and couldn’t resist any longer!! Are there any new monsters to look out for and star guest appearances? There’s a terrifying Cyborg in the old West, and wait till you see what’s invading Earth in episode 4. There’s never been an extra-terrestrial incursion like this one!! Guest stars include David Bradley, Rupert Graves, Stephen Berkoff, Mike McShane, Ben Browder, Adrian Scarbourgh and Anamaria Marinca. As well as filming in and around Cardiff, you ventured abroad to Spain and NYC for episodes 1, 3 and 5, what was it like to shoot in those locations? I don’t think I’ve ever worked on a show before that’s had foreign location shoots on three out of five episodes – it’s quite astonishing. We have snowy mountains for the series opener, New York for the finale and along the way a full-blooded Western shot on location where all the best cowboy movies come from – Spain. Location shooting at this level is such a blast of fresh air for the show – wide open spaces and wide open skies! It’s easy to say “movie scale” but that really is what we’re delivering. We know to expect Amy and Rory’s departure in episode 5, why was it decided that this should be the time for them to go and with an episode featuring the Weeping Angels? The story of the Ponds hasn’t even begun to end yet – they’ve got loads more adventures with their mad friend the Doctor ahead of them, and we’ll see more of their lives and Time Lord-complicated relationship than we ever have before. This more than any other, is the year of the Ponds. But, yes, it’s true, I cannot lie – somewhere out there, the Weeping Angels are waiting forthem…. What are you going to miss most about the characters and Karen and Arthur? Amy and Rory have been with the Doctor since I took over the show, they’re part of the landscape for me. It was just traumatic to consider a future without them. Amy is everything I admired (and sometimes feared) about strong, clever, reckless women, and Rory is the man I’d like to be – so strong he never has to show it. Karen and Arthur have become friends, and I still can’t get my head round the fact that I’ll never find them on the set again. Brilliant performers and warm and lovely people – the best of the best. Donning the compulsory tweed for the third time, Matt Smith gets ready for more adventures through space and time as the Doctor. Herehe talks about his hopes for the new series, what fans have to look forward to and saying goodbye to the Ponds. Asylum of the Daleks is going to be a cracker, states Matt as he talks excitedly about the opener of the new series. Steven has written andabsolute belter and we have made the Daleks scary again, something I am not sure we got right before. With five big adventures for the Doctor and his companions, this series it is set to be epic. We have five of the most exciting standalone episodes, with everything from Daleks to dinosaurs and of course, the fall of the Ponds, explains Matt. During this series Matt Smith’s Doctor gets faced with a lot of new challenges. Not only did he get to live out many a childhood dream of becoming a cowboy for the day by riding a horse in the western themed episode,A Town Called Mercy, but he also got the once in a lifetime opportunity…to ride a dinosaur. More painful than you can imagine, Matt gives us an insight into just what that was like, I had to wear padded trousers! Dinosaurs are a lot lumpier than horses, so it was a painful couple of hours, a laugh though and definitely worth it as it’sgoing to look great. With Asylum of the Daleks featuring Daleks from all of The decades, does Matt have any favorites? Absolutely! The blue and white ones from the 1960s, I think they are from the Troughton era…they are just kind of groovy, smaller but fantastic. And the lovely Barnaby (Edwards) who operates them. The day we filmed with all of those Daleks there was such an excitable atmosphere on set from cast and crew alike. It was a brilliant few days at work! The second episode sees viewers taken on an incredible prehistoric adventure with the unusually titledDinosaurs on a Spaceship, so what did Matt think when he first heard those four words? Steven you are a genius! It’s Doctor Who in a nutshell. I have always wanted to do a dinosaur episode, he continues, so I was very pleased to get the chance. And the Director Saul (Metzstein) has done a fantastic job, with David Bradley playing a cracking villain. I think it is such a fun episode with a wonderfully crafted script by Chris Chibnall. As the most ambitious season to date, locations play a key role in creating scale and meeting that ambition. Travelling to the Spanish mountains for episode 1, Almeria in Spain for episode 3, A Town Called Mercy, and New York for the Pond’s departure in episode 5, Matt believes they really help transport the viewer and the character, commenting that, There is only so much CGI can do.We were in the middle of a western village, which was brilliant for Doctor Who,adding to the imagination of it all. And I am such a fan of New York, and we got to use some properly iconic locations, like Central Park. There is nothing quite like running through Times Square trying to shoot a scene. As well as visiting new locations and facing new monsters, Matt got his first taste as TheDoctor of what it is like to be on the receiving end of one of the show’s most widely known formulas, a change in companion. It was terribly sad and I do miss them as they are such great chums, Matt shares his thoughts on his last days on set with Karen and Arthur, we knew it was coming, but just didn’t believe it. It is one of those things like when you are on holiday and you suddenly realize it is Friday and you are going home on Monday. But that is what the show is about, evolution and regeneration, and we now have Jenna who is lovely and great. So did he agree with Steven’s choice to send them out in an episode with the Weeping Angels,Oh absolutely, I think I can speak for all of us when I say that the Weeping Angels are one of our favorite monsters. The fact that they don’t speak just makes them crueler. And with the last episode set in New York and to have River back, it all just made sense. I really think, Karen and Arthur go with a bang and tear! Stupid dancing, stupid faces and stupid everything, is how Matt sums up what he will miss most about having Karen and Arthur on set. Being ridiculous, there were points when we wouldn’t even have conversations, but just make noises at each other. We had a laugh and that really informed the energy and spirit of the show. The relationship between our characters on screen and off screen really blurred! Renowned for his pranks on set, Matt gleefully explains how much he used to enjoy making Karen scream, I used to hide in her trailer a lot and just jump out at her and she is a real screamer. Or I would dance really close to her face, which would also make her scream! It was very much like a brother and sister relationship with Arthur and I pranking her like older brothers! It’s Karen Gillan’s last season as Amy Pond. Having travelled through space and time for three years, she is about to hang up her TARDIS key. Here she gives us a glimpse at what is to come in episodes 1 to 3 from Daleks to Dinosaurs and some thoughts on her departure. This season has been done in a really interesting way with five standalone epic episodes, like a movie a week, all building to the departure of the Ponds! We actually kick-off the season with Amy and Rory’s relationship in a sticky situation; it is less than marital bliss. Those scenes were really interesting to do, she explains, because they created such a different on-screen atmosphere between Amy and Rory, something that the viewers wouldn’t have seen before. That is the good thing about Doctor Who, it gives you the chance to shift the character, and you never know what is going to happen from episode to episode. Karen is talking excitedly about the return of the Doctor’s most fearsome and famous enemy the Daleks. The opener to season 7, Asylum of the Daleks, will feature the most Daleks ever to be seen on screen and from the different decades, including a special appearance from Russell T Davies’ Dalek. I am so pleased that he now owns an official Dalek, it was a real honor to act opposite him and I think he is going to go far! she says rather cheekily. I think my favorite is the 1960s Dalek with the white and blue armour, she continues, there is something more menacing about them as they are smaller and they just look so original. If I was going to own one, it would be one of those, Karen concludes, I would keep it in my kitchen. But it isn’t all upset for the Ponds, as the adventures continue in episode two with Dinosaurs on a Spaceship, written by Chris Chibnall. That was a crazy filming adventure, exclaims Karen, with all the adventures that I have been on through-out the show that was perhaps the most surreal! There was a lot of running from things we couldn’t see, whichis always fun, BUT a couple of the cast got to ride a dinosaur…..
Mark Williams comes along for the ride as Rory’s dad Brian Williams. He was so fantastic, naturally funny and such great casting, you could totally imagine Rory having a dad like that. This series has some great guest stars, characters and of course monsters, she teases. Guest stars making their Doctor Who debut are James Bond Baddy, Steven Berkoff, Jemma Redgrave and Ben Browder. Alex Kingston as River Song makes her return in episode 5, just in time to say goodbye to Amy. While the majority of the filming was done in the home of Doctor Who, Cardiff, the cast and crew found themselves in the perfect spaghetti western location of Almeria, Spain, giving Toby Whithouse’s episode 3, A Town Called Mercy, a truly authentic western feel…. So much fun, claims Karen, using a location that had actually been the set for other westerns made everything feel so much, well, realer. In the episode Amy Pond gets her hand on a gun, something Karen agrees that she really shouldn’t be let anywhere near. 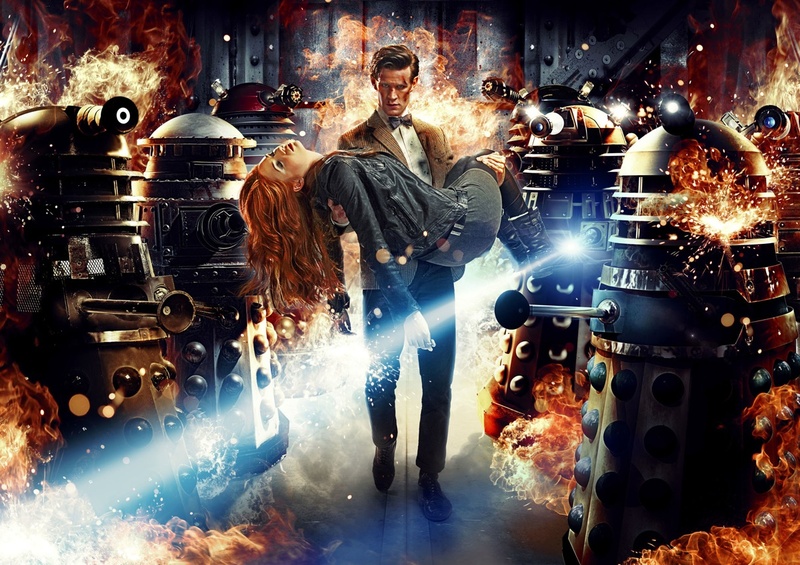 Definitely, Amy Pond should be nowhere near a gun, exclaims Karen. I remember for a previous episode I had to fire a gun with blanks, followed quickly by Rory shouting ARGHHH as though I had hit him. I completely forgot this when action was called, so when I fired and he shouted I really thought I had shot him! It was awful! In this episode when she gets hold of a gun you can see the fear on the faces of the other characters, but they weren’t acting, I genuinely think all of the actors including Matt and Arthur were in fear for their lives! Featuring an alien with a score to settle A Town Called Mercy also reveals a different side to the Doctor as Amy claims, So this is what happens when you travel alone. In the series we see a slight shift in the Ponds’ relationship with the Doctor, Just as any relationship changes when it matures, explains Karen. We get to see a glimpse of what Amy and Rory do when the Doctor isn’t around and how the adventures and time away from home has affected their own relationships with friends and family. I think the Doctor also begins to realise how he has changed Amy and what happens when heisn’t there, and at first he doesn’t really understand it. There is a really sweet moment in episode 5 when the Doctor notices Amy is wearing glasses, she hints. Following the Western the series takes us to Amy and Rory’s house and a deadly outbreak, before heading to the final episode of the Ponds, shot in New York and with the return of the Weeping Angels. The never ending pranks and my two best friends, Karen is talking about what she is going to miss as she takes her bow from the show, Matt used to hide in the cupboard of my trailer and jump out of it at me and I used to go flying back against the wall in absolute shock! He must have done it like a hundred times and I fell for it every single time! But honestly even with the bruises, it really was the biggest and most exciting time of my life. I wouldn’t change it for the world! I always knew that Steven had an ending for Amy Pond and when I met with him a year or so ago it was kind of like, so what are the plans for the character and we both said that she should go at this point. It was such a fantastic mutual decision and completely the right time for Amy to leave. I will miss her, but I can’t wait for fans to see what happens…..
Having joined Doctor Who in the fifth season, Arthur became a regular character in season six and is now set to make his departure alongside onscreen wife Karen Gillan in episode 5. Here he shares his favorite moments, monsters and how you can make Karen scream! Rather wonderful, the great thing about Doctor Who is that it always tries to better itself and that has really happened this series, Arthur is talking fondly about the upcoming series, it feels like a movie! What is fantastic is that the Daleks are actually scary in this episode, continues Arthur as he gives his thoughts on Asylum of the Daleks. It was quite an odd experience being on set that day, not only because of all of the Daleks, but because there was generally a lot more people on set as they were so excited about what was about to happen. Such an amazing title, but to be honest I wasn’t sure how they were going to do it, getting Dinosaurs on a Spaceship! But that episode is made extra special with Mark Williams playing Rory’s dad, he was just hilarious, so lovely and just a funny guy, remembers Arthur. With one of the biggest sets ever built to house the prehistoric creatures, Arthur exclaims, The dinosaurs were huge, going on set was like walking in to a massive aircraft carrier. So with Amy and Rory’s relationship in a slightly sticky situation in episode 1, how did Arthur find that to play? Every relationship has their rocky moments, Arthur explains, but it was quite fun to play out a problem in their relationship and it shows a different side to both of their characters and makes them more real. I think that was an important side to show. In episode 3, A Town Called Mercy, we see The Doctor and his companions in a western themed setting, where Amy Pond gets her hands on a weapon. I am always terrified when Karen picks up anything! Of course there was a guy there to make sure it wasn’t loaded. But Karen is better at these things than she pretends to be, even though she looks like she is made of spaghetti! I am a huge fan of westerns, me and my dad used to spend Sunday afternoons watching them, so it was kind of like living out a boyhood dream, filming in Almeria where so many westerns had been shot. Along with Karen Gillan, Arthur makes his exit in episode 5, but before we get to that heartbreaking ending there is glimpse of the Pond’s everyday life in episode 4, a side to the couple that hasn’t previously been explored. So what does Arthur think about his exit? Just brilliant, he exclaims, I was really happy to go out in an episode with the Weeping Angels. They are a relatively new monster, but Steven immediately made them a classic. I think they are one of the scariest villains within Doctor Who and episode 5 is very creepy, he hints. Are there any other monsters that Arthur favored? The Silence were pretty good, they look scary. Along with the Weeping Angles they have a psychological effect. Steven is good at writing those, making quite terrifying television! We know Matt is fond of pranks on set, but did Arthur also torment Karen? During down time on set if there was a lull a great way to entertain yourself was to tell Karen that a moth was flying around her head. She would literally go mad, flinging her arms around and screaming, it was hilarious! She hates anything with wings! The people, it is such a big family, Arthur is explaining what he will miss the most about the show. But me, Matt and Karen still chat every few days and meet up when we can. The great thing about Doctor Who is that you get to work with the best of the best. It has been such a fantastic adventure and I hope everyone enjoys the remainder of the ride. BBC AMERICA delivers US audiences high-quality, innovative and intelligent programming. Established in 1998, it has been the launch pad for talent embraced by American mainstream pop culture, including Ricky Gervais, Gordon Ramsay, Graham Norton, and successful programming formats including ground-breaking non-scripted television like Top Gear and top-rated science-fiction like Doctor Who. Owned by BBC Worldwide, the commercial arm of the BBC, BBC AMERICA has attracted both critical acclaim and major awards including an Emmy®, five Golden Globes® and ten Peabody Awards. The channel attracts one of cable’s most affluent and educated audiences and is available on cable and satellite TV in more than 79 million homes. It broadcasts in both standard and high-definition in all markets, with content available On Demand across all major digital platforms. Online, www.bbcamerica.com is the place to go to dig deeper into pop culture with a British twist. Find out more by visiting www.press.bbcamerica.com or follow us onwww.twitter.com/bbcamerica. This entry was posted in GEEK ALERT!, TV NEWS and tagged bbc america, doctor who, new trailer, premiere date, press release, science fiction, SciFi, season seven, television series. Bookmark the permalink.